While Topps Allen & Ginter has long maintained a retro design, the exclusive die-cut set found at the 2015 National features a more modern spin with an x-shaped die-cut. The 100-card 2015 Topps National Allen & Ginter Die-Cut set includes both baseball and football players as well a few historical figures and locations that are significant to Chicago. 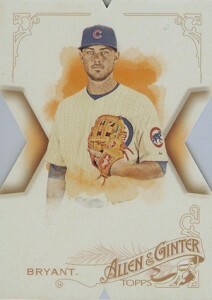 Shop for 2015 Topps National Allen & Ginter Die-Cut cards on eBay. Home to the 2015 National Sports Collectors Contention, Chicago is also heavily covered in the die-cut set with current and former greats in the NFL and MLB. While the overall A&G design is still clear, the unique look offers collectors an appealing alternative with a distinctly different feel than the base 2015 Topps Allen & Ginter Baseball design. 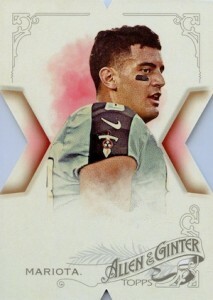 Among the 2015 Topps National Allen & Ginter Die-Cut checklist, the first 70 cards feature baseball players and the next 25 subjects are all football players. The last five cards feature notable subjects and landmarks to Chicago. Parallels include 10th Anniversary (#/10) and Glossy (1/1). 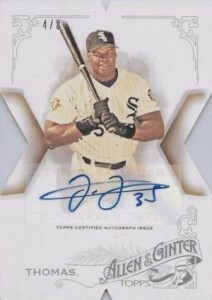 There are also signed parallels for 31 athletes. While print runs vary, all the autographs are numbered and feature sticker signatures. Collectors could originally obtain the exclusive cards by bringing a sealed box of 2015 Topps Allen & Ginter to the company's booth where they could choose between football or baseball packs, each with five cards. Gold packs contain football cards and the silver packs feature baseball players. 100 cards. Shop for base cards on eBay.